A statue of a person dead for 113 years does not often overwhelm a leading university and dominate national headlines. But earlier this month, politics student Chumani Maxwele emptied a bucket of excrement over the statue of Cecil John Rhodes at the centre of the University of Cape Town's campus in South Africa. Mr Maxwele's protest has electrified longstanding resentments about the ways in which the past is remembered and celebrated. It has also crystallised deep and entrenched disagreements about student admissions, the university curriculum and academic appointments. Rhodes was a British Victorian mining magnate and ardent advocate of colonialism, who gave his name to Rhodesia and became an influential figure in South African politics. Protesters are now demanding that his statue be removed. Rhodes' brooding image and the University of Cape Town (UCT) campus are framed by Devil's Peak and the World Heritage site of Table Mountain. They look out over the Cape Flats and its townships and informal settlements, many of which still lack basic services. Extreme income inequality remains a persistently stubborn problem more than two decades after the end of apartheid. Inevitably, issues that are precipitated by symbols and fought through at the university have a far wider resonance. Nelson Mandela, who was awarded an honorary degree by the university within weeks of leaving prison in 1990, knew this. When opening the new national museum on Robben Island, he said: "Having excluded and marginalised most of our people, is it surprising that our museums and national monuments are often seen as alien spaces? "With democracy, we have the opportunity to ensure that our institutions reflect history in a way that respects the heritage of all our citizens." Mr Maxwele's protest was in the tradition of guerrilla theatre - unexpected performances in public places designed for maximum impact. Wearing a brightly coloured safety helmet and two placards - "Exhibit White Arrogance UCT" and "Exhibit Black Assimilation UCT" - Mr Maxwele emptied his bucket in front of the press, who had been tipped off to attend. Mr Maxwele was already well known for protesting against the privileges of power. Arrested in 2010 for gesturing at President Jacob Zuma's motorcade, he successfully sued the minister of police for wrongful arrest. His university protest has again touched a point of acute sensitivity, setting off widening responses and reactions. Mr Maxwele's guerrilla theatre referenced an established mode of protest in Cape Town. While South Africa's 1996 constitution guarantees equity in access to basic services, many in the poorer districts lack basic services, such as sanitation. In June 2013, raw sewage was thrown at Western Cape Premier Helen Zille while she was visiting a township in the city, and buckets from portable toilets were emptied in the Legislature. Similar protests have continued, including the arrest of some 200 people travelling into the city with bags of excrement and the dumping of sewage at Cape Town International Airport. In his protest at the university, Mr Maxwele was taking this form of confrontation to another of Cape Town's iconic places. 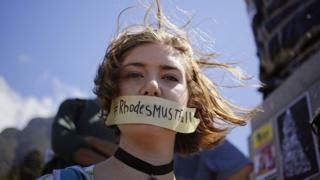 Will the fallout from the Rhodes statue protest be one in a series of punctuations in an ongoing trajectory of change? Or will it precipitate the radical shift called for by the university's student representative council and black staff group, TransformUCT? Dean of humanities Sakhela Buhlungu thinks that Mr Maxwele has pushed open a door to radical change. A sociologist and expert on the labour market, Prof Buhlungu has seen how "symbolic moments" can result in the convergence of pressures for change. Speaking at the Vaal University of Technology a few weeks before the Rhodes statue controversy exploded, Prof Buhlungu expressed the mounting frustrations across a number of universities at employment practices that count against black South Africans. In parallel, students are increasingly calling for changes to the curriculum, and for academics who are more representative of the diversity of their country. Student Rekgotsofetse Chikane said: "Why must it be that a student at the University of Cape Town is pushed to the point of having to throw faecal matter over the statue of Cecil John Rhodes in order to have a conversation about transformation?" Mr Chikane says the issue is the "subliminal racism... that makes you ignorant about your subjugation because you are never challenged to seriously engage on critical matters". The University of Cape Town's first response to these calls for action was to convene a discussion about heritage, signage and symbolism. But before this could convene there had been further protests centred on the Rhodes statue, now swathed and taped in black rubbish bags. By the time that these first negotiations with the university administration were convened, the student representative council position had hardened. The students' president Ramabina Mahapa said: "I understand it is part of history, but the institutional representation of black people at this university is negative. "The SRC [student representative council] has taken the stance that the statue must come down". The students walked out of the meeting. From here, the "Rhodes Must Fall" movement escalated rapidly, culminating in a march and the occupation of the university's administration building. Vice-chancellor Max Price has responded with university-wide debates and a special meeting of the university senate to consider proposals. He has said that he and his executive favour removing the statue, but only the university council can decide. An emergency meeting of the council has been called for 25 April. Meanwhile, the stand-off has become a national issue. Students at Rhodes University in Grahamstown have protested in sympathy and higher education minister Blade Nzimande has given his support for moving the statue. Where next? If Prof Buhlungu is right, then symbolic changes - or the removal of the statue - will not be sufficient. There will also need to be significant changes to the university's curriculum, its staff profile, and its admissions policies. Because the University of Cape Town is South Africa's - and Africa's - highest-rated university in global rankings, such changes will have implications across the higher education system as a whole. Mr Chikane sees the university as being in "the unfortunate position of being a European university stuck at the bottom of Africa". This could change. While views on what should be done to resolve these issues continue to differ sharply, few will have any sympathy with Cecil John Rhodes. In his 1877 "confession of faith", Rhodes wrote: "I contend that we are the finest race in the world and that the more of the world we inhabit the better it is for the human race". Such a set of beliefs puts Mr Maxwele's guerrilla theatre in perspective. Whether this is a moment that will be remembered for its consequences, or just another flashpoint on a long, slow, road to change, remains to be seen. Martin Hall is emeritus professor at the University of Cape Town's Graduate School of Business in South Africa and a former vice chancellor of Salford University in the UK.